Free Science Class season is over (as of the end of February..I've just been too busy to post!!) We had about 700 students attend the classes within the 1 1/2 months during which they were offered! A grant from the Institute of Museum and Library Services (IMLS) enabled us to provide bussing stipends and offer the program free of charge. As a result, we've been able to schedule 4th and 5th grade students from public schools across the Northern Olympic Peninsula! Overall it all went very smoothly and we felt like the students had fun while also leaving with increased knowledge and curiosity about marine communities' conservation. If you remember, I posted a blog about the Orca Communities class a few weeks ago. 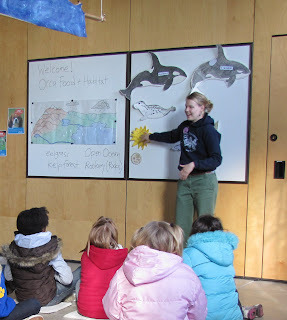 This posting is about the second of the two classes; Orca Food and Habitat. Through exploring food web connections, the objective of this class is to have students realize the complexity and vulnerability of marine ecosystems. We begin by discussing what a food web actually is and how it's connected to the geographic area it's found in (the watershed in particular). During this we remove elements of the web, such as plankton and speculate on how interconnected the web is. Students really seem to grasp the idea that giant mammals like Orcas are dependent on the health of plankton, even though they aren't directly consuming those tiny organisms. Some kids even made the connection that if we remove one animal from the web, not only will others starve, but the prey of the "extinct" animal will also experience a massive population boom! 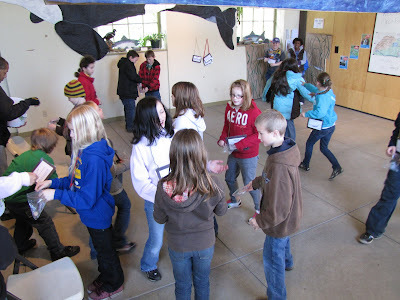 We then play a food web game where the kids all "become" animals in the Orca food web (herring, salmon, seals, orcas). There are two food webs being acted out- the resident killer whales (only eating salmon) and the transient killer whales (subsisting on seals). Each type of animal has a corner which has been decorated to represent their home habitat. 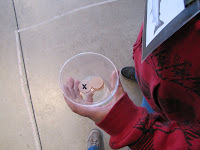 The kids have wooden tokens that represent food and they tag each other to pass off their "stomach contents". The game rapidly descends into a chaotic feeding frenzy. The "animals" during their feeding frenzy! After two rounds of the game we discuss who survived, who starved to death and then we count the number of tokens in their "stomachs" that have black "x"s on them. These represent TOXINS! During the game the toxins move through the food web, accumulating in each organism and magnifying in quantity as they travel up the food chain. Mimicking a natural food web, animals at the top (Orcas) have the highest concentrations of toxins, a phenomenon called "biomagnification".